At our November 2004 meeting, we were honoured to host ex Branch Vice-Chairman Steve Beck. Unfortunately the venue was totally unsuitable, which made it difficult for everyone to hear what Steve said, what follows is a summary of the main points. Apologies if there's any misquotes, but as we said, the venue wasn't really suited to listening. We would like to thank Steve and hope to have him back very soon. Manager. After the match against Forest Green [6 November] the Board decided it was time to take action about the role of Manager. Steve spoke to Chris on Sunday [7 November] and told him that he would be relieved of his manager role. He was very disappointed. He has given 110% but it has not worked. The team and Viv Busby were informed of the decision and encouraged Chris to stay on as a player. What's Next. Is this (Viv Busby) a permanent position? It is possibly for the rest of this season [mainly due to lack of finance to take on a new contract]. Has Paul Groves expressed an interest in the manager job? No interest shown. The role of who manages the club will be reviewed when the budget for the 2005/06 season is available. Decisions will then be taken as to whether we can afford to, or want to advertise for a new manager [if needed]. Viv has confirmed that he is happy to continue working with Lee Nogan. Finances. Steve explained how in Chris Brass' first season as manager, his budget was just half of what Terry Dolan had had the previous season. This season, Chris had a budget of just one third of what he had the previous season. This season we've lost Football League funding but had a one off £125,000 parachute payment. We lose this next season, but will be eligible for a share of the Conference TV money of £45,000. Full Or Part Time Players. Will we have a team of part time players next year? We may have a mixture of full and part time players, although nothing has been decided yet. Some clubs are finding it easier to attract good part time players as they may be better off financially. Many of the current players are on one year contracts, however, in the future we may need to look at ways of reducing the wage bill. Steve gave the example of Leigh Wood, now playing at Harrogate who is better off playing part time and working full time. Steve knew of other players in a similar position. Youth Policy This is extremely important to the club and Steve is very keen to keep it going, although its a cost of about £20,000 per year. We have started the centre of excellence, and need to review how we are to fund this in the future. Website. The club still have no website - why ? Steve agreed to ask questions when he got back to the club. One of the directors has a lead role. The two main issues that need to be considered, the design of the site and the mechanisms to keep it updated. Steve's Role As Club Chairman. Steve was appointed as Chair of the club when the Trust gained ownership of the Club. When he was asked to renounce the role and title of Chair recently, he quickly agreed to support the idea of corporate governance. With hindsight, he thought he should have gone back to the Trust Board to discuss the issue before making his decision. Project Spirit, to look at the whole issue of corporate governance. has now been set up. At the recent Supporters Trust AGM, the proposal to reinstate the role of Chair was agreed. 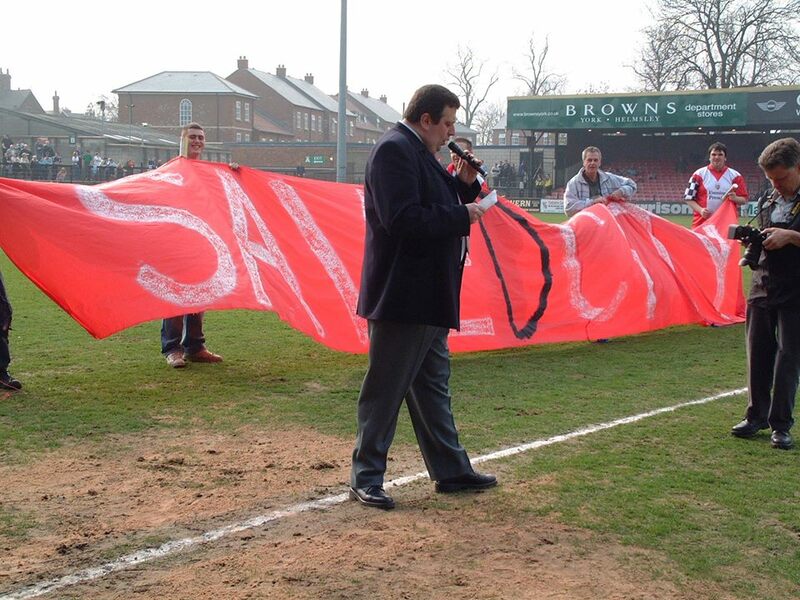 Steve supported this proposal and saw the role of Chair as a figurehead representing the club. New Ground. The club is in the final stages of signing the legal documents to finalise the purchase of the ground from Bootham Crescent Holdings. Once signed the club will have to apply for planning permission with Persimmon Homes for 93 homes to be built on the site of the football club. The club and council are now working very closely together. The FA have looked at the Huntingdon site but would not support its development, however, it would have to be included in the planning process as it is the nearest site and needs to be formally rejected. The future ground would aim to have about 10,000 capacity and it is likely that it would be a ground share with the rugby league team, so the RL contacts would be involved in future decisions. No decisions on the preferred locations have been made yet, lots of sites have been suggested, including Clifton Moor, Civil Service ground (Boroughbridge Road), York Central (carriage works), Foss Islands Road, Terry's old factory site, and Naburn. For anything central, City would probably have to outbid housing projects. The plans for the new football ground will include offices, restaurant, conference facilities, and more hospitality boxes. This would help to generate a lot of income for the club (which is limited at the moment) and so Steve hoped that the new stadium will be developed quickly. Steve had recently visited cash rich Macclesfield whose own ground hosts a computer training suite which has recently taken over £500,000 in fees from the EU. Their ground also hosts sportsman's dinners, they make around £30 profit for each £35 ticket sold whilst City make just £5 from each £35 ticket as we have to hire venues and caterers. Terry Dolan. Steve confirmed that the newspaper story about Terry Dolan telephoning the club to offer his support was not true. Steve was not aware that Terry had made any phone call to the club. 50th Anniversary of City reaching the FA Cup semi final. (1954-55 season). Steve said that a dinner was being arranged to honour the occasion. The club planned to contact Newcastle United to discuss rearranging a friendly match in the spring. In addition there are some YCFC Christmas cards in the club shop which feature the 1954-55 squad.